Outrage is growing in Queensland over the transfer of a re-detained Iranian asylum seeker from the Brisbane Immigration Transit Accommodation (BITA) to Wickham Point in Darwin. The 21 year old, Mojgan Shamsalipoor, was re-detained eight months ago and had been completing school at Yeronga High School. But with 12 weeks to go, Mojgan was abruptly transferred to Darwin. The transfer has ended her hopes of completing high school this year as well as separating her from her Iranian husband, Milad Jafari, a refugee and permanent resident. 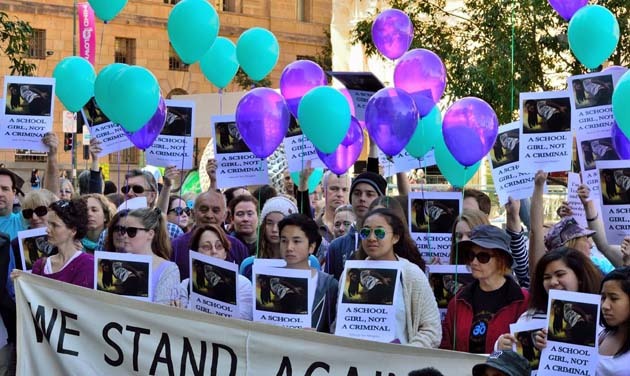 The move by the Immigration Department has angered teachers, parents and students at Yeronga, who turned out in numbers to join a 200-strong Border Force Act protest in Brisbane on 8 August to take a stand against Mojgan’s transfer. Now, the Queensland Teachers Union has backed the Yeronga teachers and called a protest for Friday 14 August, outside the Brisbane Parliamentary Offices at Waterfront Place. At least two other children were pulled out of Brisbane schools when their families were transferred to Darwin the same day as Mojgan. Yeronga teacher, Jessica Walker, said Mojgan’s sudden removal from Brisbane had left fellow students “distraught” and teachers and parents in shock. “Forty-seven of our students, including Mojgan, are on these bridging visas or with no visas,” Walker said. Mojgan and her brother are among the scores of Iranian asylum seekers who were re-detained at the end of last year, and scheduled for removal to Iran, despite the government knowing that Iran would not accept asylum seekers forcibly removed from Australia. Iran re-stated this position against the efforts of Foreign Minister Julie Bishop when she visited Iran earlier this year. Mojgan’s transfer has highlighted the complete contempt with which Immigration deals with asylum seekers—ripping people out of school, separating husbands, wives, partners, families, and support networks. It has also highlighted the fact that the re-detained Iranians are pointlessly being held in indefinite detention. The union action is a very welcome development in the aftermath of Labor’s national conference anti-refugee decisions. It shows the very real possibilities of building the deeper community links for the refugee campaign that really can push Abbott back.